Below I have added a copy of the html that formed the body of my Google Sites page. 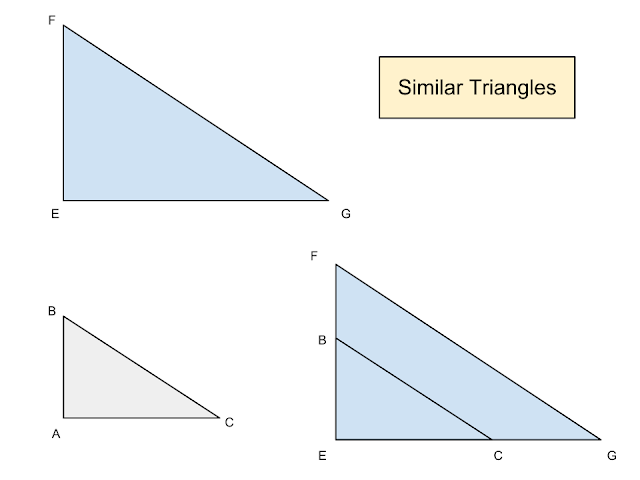 If two triangles have all their angles equal, then the lengths of one side divided by its equivalent on the other triangle is the same for all sides. By equivalent sides it is meant the sides opposite the same angle. Let ∇ABC be the lesser of the two triangles. Place ∇ABC on ∇EFG so that point A coincides with point E and AB lies on EF and AC lies on EG. This can be seen on the bottom right in the accompanying diagram.